How much does a Hublot Ayrton Senna cost? The luxury brand Hublot has dedicated several watches to the beloved Formula 1 driver Ayrton Senna. Some are in the Big Bang collection, while others belong to the Masterpiece series. Top models are made of carbon or King Gold and have a tourbillon. The Hublot Ayrton Senna is available in several limited editions. They are popular among collectors thanks to their extremely restricted numbers. The main feature of these luxury watches is the recreation of Senna's signature on the front. Hublot creates the cases and bracelets using high-tech materials from Formula 1 such as carbon, ceramic, and Nomex. Nomex is a flame-resistant textile used to make the drivers' racing suits. The King Power Tourbillon Senna is the top model and is limited to 10 pieces, making it exceptionally rare. Each case back features a unique image from an important moment in Senna's career. This chronograph has only one pusher and is made of carbon. The skeletonized in-house movement HUB6300 includes a flying tourbillon and is therefore very accurate. It also boasts a 120-hour—or 5-day—power reserve. Ayrton Senna was a Brazilian racecar driver and three-time Formula 1 World Champion. He raced in a total of 161 Grand Prix, of which he won 41. His most important victories came while driving for McLaren. Senna was in the lead when he died in an accident at the 1994 San Marino Grand Prix. 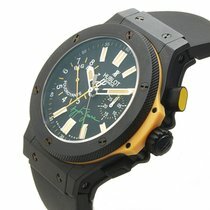 You can purchase a Hublot Big Bang Senna in black ceramic for about 12,100 USD. Never-worn examples are extremely hard to find due to their limited numbers and are therefore much more expensive. Expect to pay around 22,900 USD for such a timepiece. This wrist watch comes with a split-seconds chronograph, which is perfect for drivers since it can measure intervals. 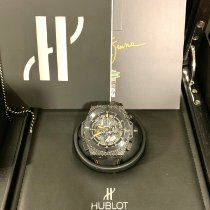 The Hublot Big Bang Foudroyante Senna goes for almost 13,900 USD pre-owned and 22,100 USD new. A foudroyante (jumping seconds) chronograph has an additional display with a hand that makes one full turn every second, allowing the user to measure fractions of a second. The accuracy depends on the balance frequency: A frequency of 28,800 alternations per hour (A/h) can measure to within 1/8th of a second, while 21,600 A/h is accurate to within 1/6th of a second. Thanks to its split-seconds chronograph, the Big Bang Foudroyante Senna can also take lap times. A pre-owned Hublot King Power Senna in carbon costs around 25,400 USD. Never-worn examples of this chronograph demand about 41,600 USD. This automatic watch has a power reserve display at 6 o'clock. The display's design resembles that of the start light found at many racetracks, while the ceramic bezel looks like a perforated brake disc. The tonneau-shaped Hublot MP-06 Senna is one of the top models Hublot has created in honor of Senna. Powered by the manually-wound caliber HUB9006.H1.1, this luxury watch comes in three varieties: King Gold, titanium, or black-coated titanium. Each version is limited to only 41 pieces. This amount is a reference to Senna's 41 Formula 1 victories. The tourbillon at 6 o'clock is the highlight of this model. The Hublot MP-06 Senna in titanium costs around 73,400 USD pre-owned and 98,300 USD new. King Gold models in mint condition can cost up to 116,000 USD. The Swiss luxury watch manufacturer Hublot isn't known for their subtlety. Their timepieces have a distinctive porthole design and use a combination of unusual materials; the company is also known for their extensive marketing campaigns. In 2007, Hublot presented the first of a number of watches dedicated to the former Formula 1 world champion, Ayrton Senna. The Senna watch from 2007 was limited to a run of 500 pieces. It's a part of the Big Bang series, and you can find it using the reference number 309.CM.134.RX.AES07. The watch is completely black, hence its name: All Black . Ayrton Senna's signature is reproduced in red on the dial. The watch is rather large, sporting a case diameter of 44.5 mm and a thickness of 14.5 mm. Its ceramic case makes it especially scratchproof, and it's water resistant to 100 m (10 bar, 328 ft), so swimming is no problem. Hublot uses rubber for the strap, which is typical for the brand. The back side of the strap features a green stripe with Ayrton Senna's name printed on it in yellow as a nod to the Brazilian flag. The second hand also pays tribute to Brazil: It has a green and yellow tip. You can view the movement through a clear glass case back. The caliber HUB44RT is not just a regular movement, but a double chronograph movement. This allows it to not only function as a normal stopwatch, but also time intervals. The caliber vibrates at 28,800 A/h (4 Hz) and has a 42-hour power reserve. Unlike most other double chronographs, there's no third push-piece on the right side of the case to time intervals. Instead, the push-piece is integrated into the crown. This solution is rarely used, though Patek Philippe uses it in their double chronographs as well. Hublot introduced the next watch dedicated to Senna in 2009, the Big Bang Foudroyante Senna (reference number 315.CI.1129.RX.AES09). The term "foudroyante" refers to a subdial measuring fractions of a second; it is also known as a jumping seconds hand. This is especially practical for the stopwatch function, as it allows you to read fractions of sections. The subdial is located at 9 o'clock and is accurate to within 1/8th of a second. Just like its predecessor, it has Ayrton Senna's signature printed above 6 o'clock. However, this model features a green signature, while the 2007 model has a red signature. The movement, HUB44RTF, is based on the popular, tried and true chronograph caliber Valjoux 7750. Hublot designed their modified version together with the company La Joux-Perret. The case has many similarities to its predecessor. They both are made of black ceramic and are 44.5 mm in diameter. However, there are also visible differences: The yellow hands and indices set the Foudroyante apart from the solid black concept of the first Senna watch. Hublot made an even bolder move with the King Power Ayrton Senna (reference number 719.QM.1729.NR.AES10) in 2010. Its black carbon case has an impressive diameter of 48 mm and a chessboard pattern. The bezel features multiple small holes, making it resemble a Formula One brake disk more than a porthole. 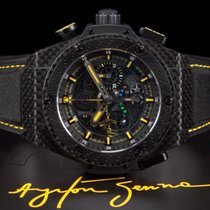 The limited edition King Power Ayrton Senna is limited to a run of 500 pieces. This eye-catcher is also a double chronograph (or rattrapante), but unlike the 2007 model, this one has a visible third push-piece labeled "SPLIT" on the left side of the case at 8 o'clock. The skeletonized dial features a power reserve display at 6 o'clock which is made up of seven colored dots: four green, two blue, and one red. When the small hand hits the blue and red dots, you know that you need to wind your watch soon. The watch runs out of power 42 hours after being wound if the barrel is not first wound via the movement of your arm or manually. The King Power special edition displays Ayrton Senna's signature at 9 o'clock in yellow. Hublot introduced the watch in 2010 for what would have been his 50th birthday. The MP-06 Senna from 2013 deviates from the previous round watches with its tonneau case . It comes in three different versions: King Gold, titanium, or black-coated titanium. The letters MP in this series stand for Masterpiece. The different versions are limited to a run of 41 pieces each. The choice of 41 was no accident: It represents how many victories Ayrton Senna had during his Formula 1 career. The gold version is paired with red indices, the black with yellow indices, and the titanium gray version has green indices. The skeletonized dial gives you a view of the movement. The black and gray titanium versions are powered by the manual caliber HUB9006.H1.1, while the HUB9006.H1.8 powers the gold model. A tourbillon adds an extra touch of elegance to the MP-06 and transforms it into the most technically ambitious Senna watch. Hublot donated a portion of the sales revenue from these watches to the Instituto Ayrton Senna . The racer founded the institute in 1994 to help disadvantaged children in Brazil. The Senna family maintains close ties to the Swiss manufacturer to this day. Ayrton Senna (1960-1994) won three Formula 1 world championships in his career and is considered one of the best racing drivers of all time. He died in an accident on May 1, 1994 while competing at the 1994 San Marino Grand Prix.